I came across this the other day and saved it because it hit me like a ton of bricks. In all the low points in my life, when I wasn’t sure I wanted to keep trying, (for anything,) when I thought I was ready to give up all hope, when the shitstorm of life had hit a point of critical mass and it was do-or-die, this is the mentality that got me through it. This – the realization and the grudging understanding that I am a fighter, that giving up isn’t in my nature, that to have stood my ground as long as I had (even if I wasn’t gaining ground,) was a mighty feat in and of itself. The realization that progress isn’t about proving yourself to others but about attaining a level of being on a plane further than your own. The utterly mind blowing recognition of my own feeble strength… I say feeble because it never seems certain at the time, it is never guaranteed and it is the kind of strength in which your knees wobble and your heart stutters and you aren’t sure you can breathe any longer, but breathe you do. That’s the kind of strength that is alarming and majestic when we find it in ourselves. The experience is only to be topped by then realizing the origin of this strength that is so deeply at your core, and giving glory to whom glory is due. So, no. 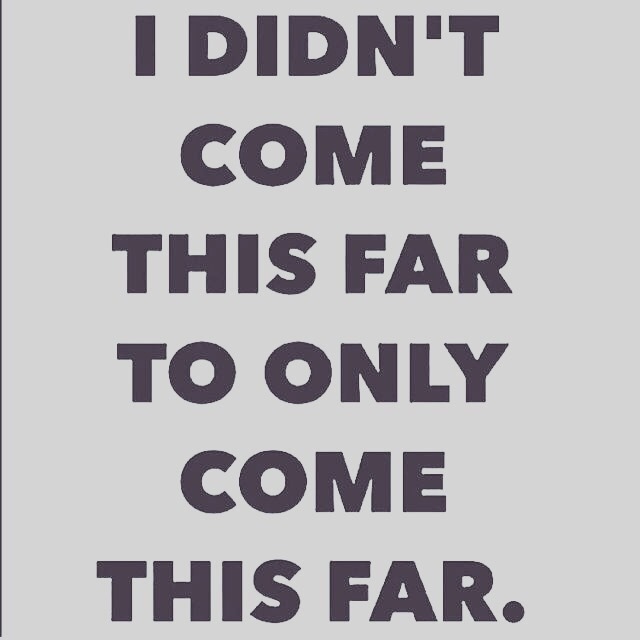 I have not come this far only to come this far. I have come this far, to go much, much farther.